Lentil Artichoke Stew is so delectable! 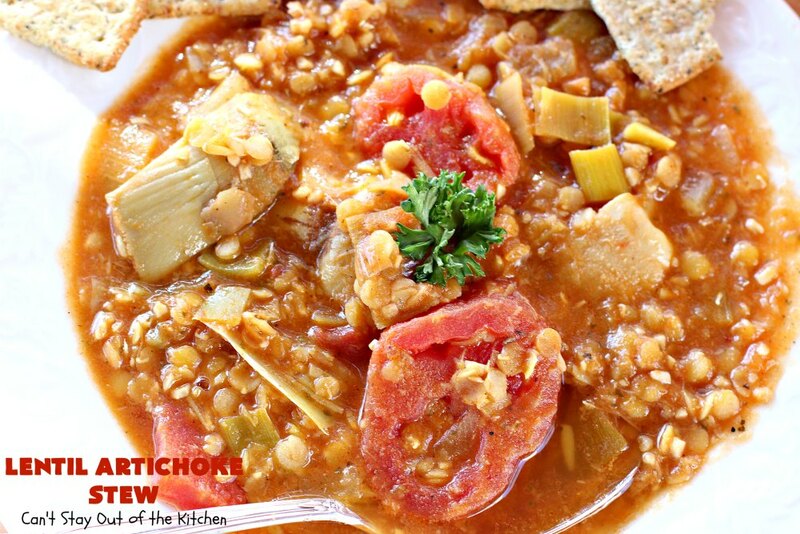 It’s a vegan and gluten free stew made with soaked lentils, stewed tomatoes, artichokes, leeks, onions and several spicy seasonings that is just awesome in taste. 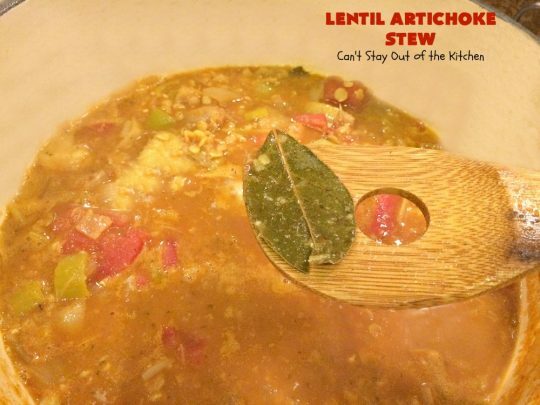 Except for the fact that I usually soak the lentils for a few hours (to aid in digestion) this recipe is quick and easy and takes under an hour to have dinner ready. 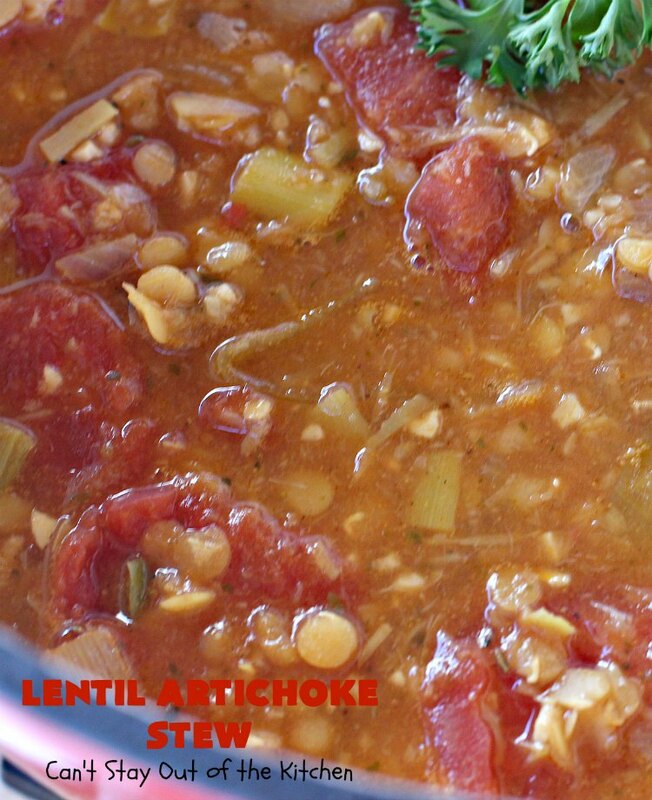 Lentil Artichoke Stew is also gluten free and vegan. Several months ago I wanted to make some kind of chowder with lentils, artichokes and tomatoes that I had on hand and when I put that info into google it brought me to The Cancer Project website which had lots of great weekly recipes. I had most of the ingredients including all the spices including coriander seed. I changed it up only slightly and the recipe was fantastic. For those wanting a healthy and filling main dish stew, this recipe meets the ticket. This recipe was their featured recipe for January 7, 2008. Truly a wonderful, flavorful stew. Lentil Artichoke Stew was one of the first recipes I posted on my blog back in June 2012. I didn’t know anything about food presentation back then and I had only one picture of the finished product with no step-by-step pictures at all. 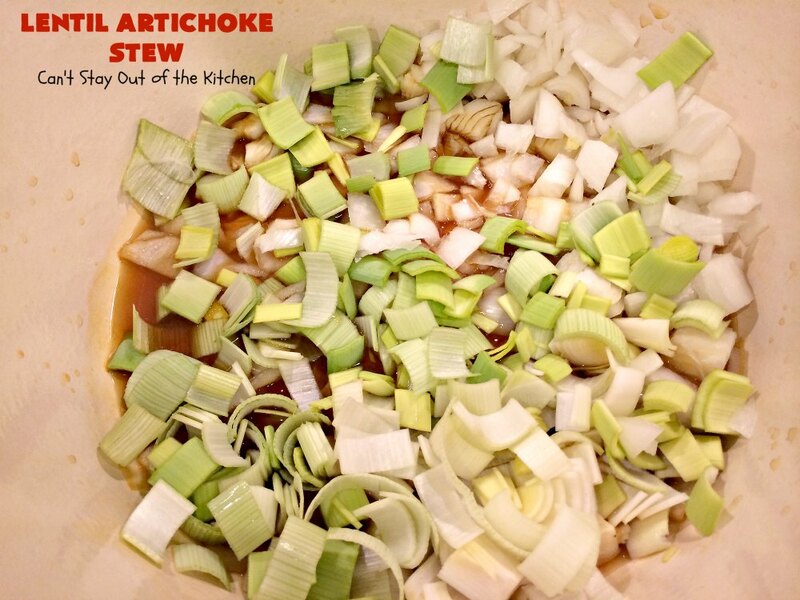 I’ve recently remade this delicious stew (April 2014) and freshened up the pictures along with adding the recipe card to making printing the recipe a lot easier. This is just a wonderful and delicious stew. I hope you enjoy it. Check out the Cancer Project website. They have hundreds of healthy recipes not only for cancer patients but for others who want to eat clean and live responsibly. 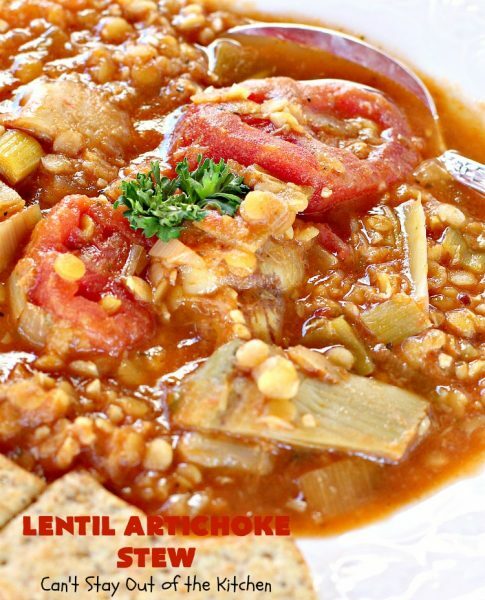 Lentil Artichoke Stew is a mouthwatering stew that’s healthy and nutritious. This tasty stew is filled with large chunks of stewed tomatoes and artichoke hearts. 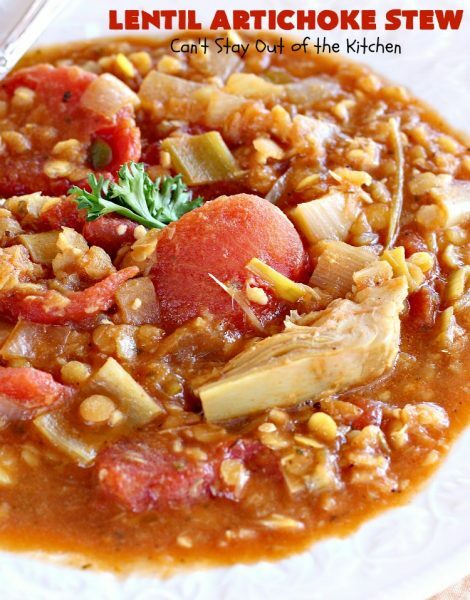 Doesn’t Lentil Artichoke Stew look yummy? I used these ingredients. The red lentils are soaking in the water on the left. Pour vegetable broth into a large kettle or Dutch oven. Add onions and leeks and heat for about 5 minutes or so. I added a leek, which if you have never used them in your cooking, you ought to consider. Simply cut off the top (green stems), wash thoroughly, and slice or quarter and slice. Be sure to get down into the inner parts of the leeks next to where the green top was removed as most leeks still contain dirt in the layers from harvesting. Add garlic, coriander and cumin and cook 2 minutes more. 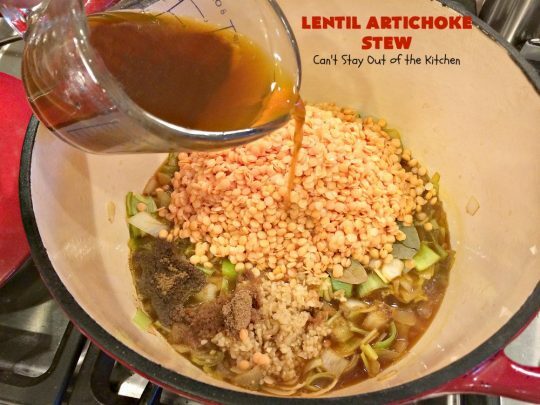 Now add lentils, bay leaf and more vegetable broth and bring to a boil. Lower the heat and add stewed tomatoes, crushed red pepper, lemon, and artichoke hearts. I also used stewed tomatoes because I didn’t have the fire-roasted tomatoes specified in the recipe. But, as noted below, diced tomatoes with chipotle peppers would probably be wonderful in this recipe if you like a little more heat. By the way, please DO NOT leave the coriander off in this recipe. Go out and pick some up at the grocery store. It is expensive, but it really makes this dish taste superb. Simmer about 20 minutes. Remove bay leaf before serving. 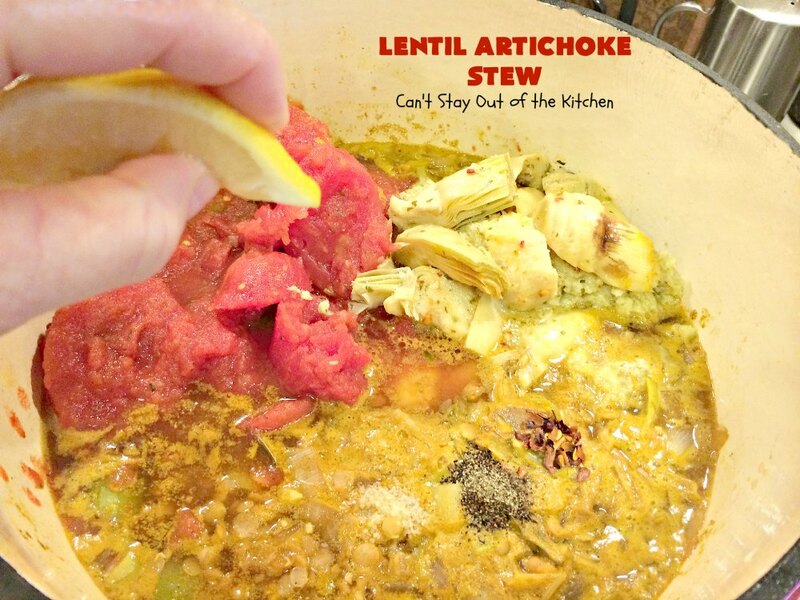 Here’s what Lentil Artichoke Stew looks like when finished. This hearty stew is satisfying and filling. This is a great Meatless Monday main dish. I really enjoyed the texture of this dish because it has both large chunks and small diced veggies. Delicious spicy stew made with lentils, artichokes and tomatoes. Add diced tomatoes with chipotle peppers for more zip! 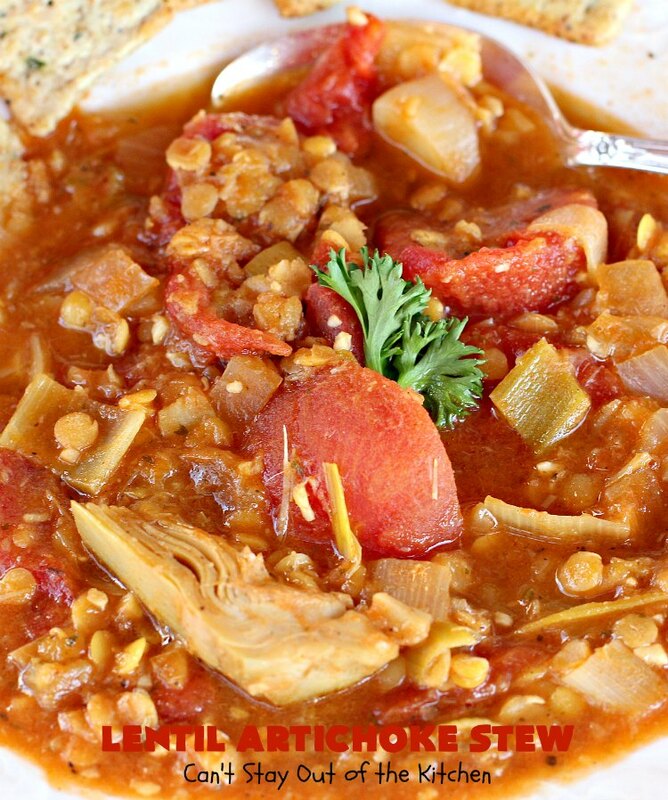 This stew is vegan and gluten free and wonderful comfort food for fall or winter nights. Heat broth in a saucepan. Add onion and leek and sauté on medium heat for about 5 minutes, until golden. Add garlic, cumin and coriander and cook for 2 minutes, stirring frequently. (Add more vegetable broth if necessary). Add dry lentils, bay leaf and water to pot and bring to a boil. Lower heat and add lemon juice, tomatoes plus their liquid, artichoke hearts and crushed red pepper. Simmer for about 20 minutes or until lentils are tender. NOTE: You may want to use 2 cans of diced tomatoes with chipotle peppers to give the stew even more zing! 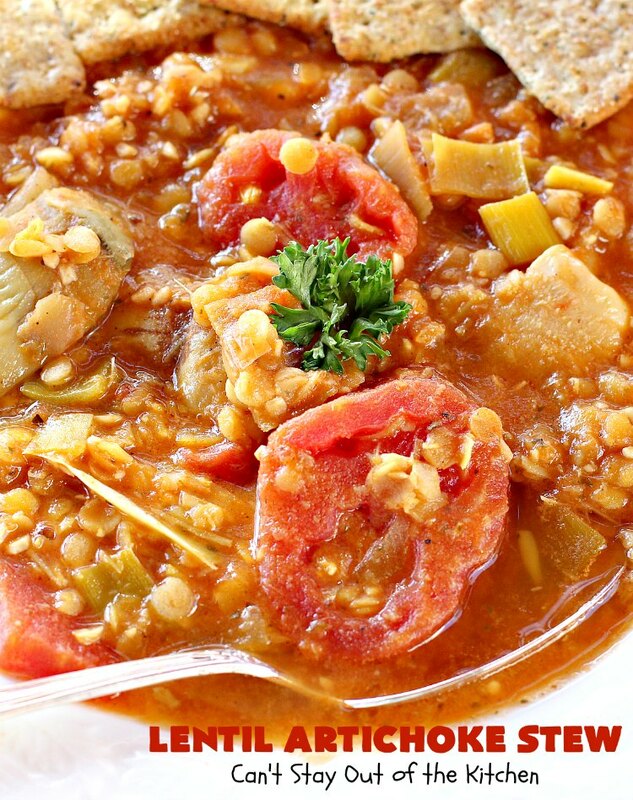 NOTE: Soak lentils prior to using, an hour or more if possible, which will aid in digestion. Drain before adding to saucepot. Recipe adapted from The Cancer Project. Delicious spicy stew made with lentils, artichokes and tomatoes. Add diced tomatoes with chipotle peppers for more zip! 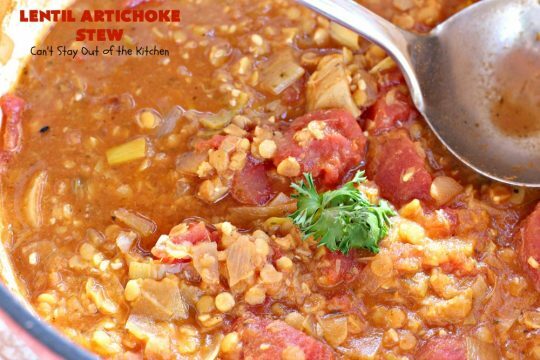 You may want to use 2 cans of diced tomatoes with chipotle peppers to give the stew even more zing! 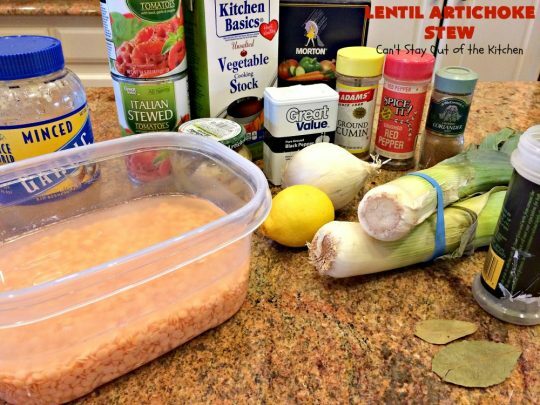 [br][br]Soak lentils prior to using, an hour or more if possible, which will aid in digestion. Drain before adding to saucepot. 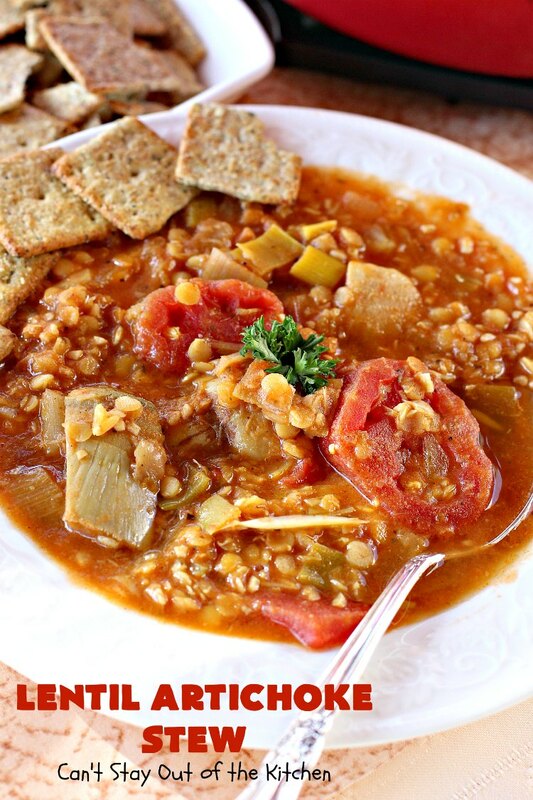 Serve Lentil Artichoke Stew with crackers or bread (even gluten free options if you desire a gluten free alternative). 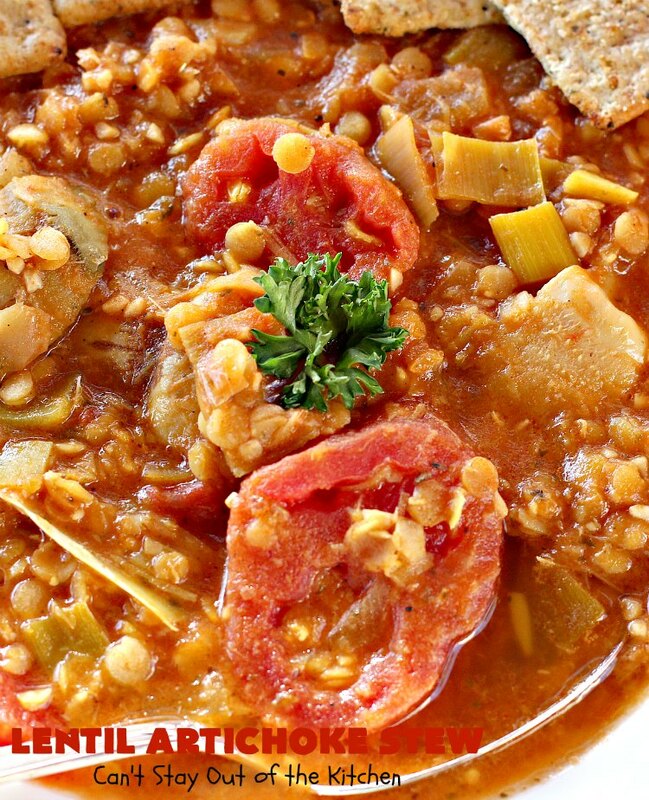 Here’s a spoonful of this scrumptious vegan stew. Lentil Artichoke Stew is healthy, low calorie and delicious. You can’t beat that! How long do you soak the lentils? Hi Jeanie. I try to soak at least an hour or two. But you can soak longer if you desire. I know you cook a lot, Ron. It really is good–healthy–and delicious.